The current trend in India of biographical films (biopics) has taken a significant diversion with films on contemporary political personalities thanks to upcoming elections and although this is peacetime, on films on wars, past and present. Two words describe most of them: patriotism and propaganda. Come April-May, India will have crucial elections to its parliament and many of the state legislatures. The campaign is already into volatile, toxic times when stating ‘us’ versus ‘you’ is costing billions. Some of these billions are being spent on making films with political themes, overt or covert, with the hope to influence the voter. Let’s be clear, they were planned well in advance. A part of the discourse narrows the line between nationalism and patriotism and this is where war has come in as entertainment to raise the adrenalin. Well, this was inevitable considering India is the world’s largest film-maker where cinema is the staple and affordable pastime for a billion-plus people. Political propaganda is conducted in most democracies and election-time bonanza is also not new. But where else, but India, do they make an average of four feature-length films a day, in a dozen languages? Considering such whopping numbers, the rash of election-eve propaganda films may look small. But the purpose is large — influence the minds of 800 million voters in the world’s largest and most populous democracy. Riding the trend is “The Accidental Prime Minister”. It shows former Prime Minister Manmohan Singh and his Congress Party in dim light. Even as it gathers mixed reviews and indifferent theatre attendance, a film on his successor and the current PM, Narendra Modi, has been announced. The cine-goer is being told: now that you have seen how (badly) Singh performed, have a look at Modi. There is no clear word, but political logic dictates that like Singh’s film, Modi’s too should make the splash in time for the elections. The Modi film may draw from his several biographies. A comic book series on his life and work shows him in glowing terms. In contrast, the low-profile and scholarly Singh has extensively written on a dry subject called economics for which he is highly respected. But that did not matter. Inputs for Singh’s film came from a single book that has harmed him politically. Written by Sanjaya Baru, Information Advisor during his first term as the PM (2004-2009), it published on the eve of the 2014 elections that Singh lost. From title onwards, the movie draws selectively on the seamy aspects of Singh. The Modi movie may well contrast the rabble-rousing orator with the soft-spoken Singh. So far, we only know who will play Modi. Vivek Oberoi has opted for his original name, Vivekananda, to remind you of the Swami (whose original name, in turn, was Narendra). At best a B-lister among the Bollywood actors, Oberoi is, however, is a fine actor. In contrast, Singh is portrayed by veteran Anupam Kher. This is not one of his good performances. Himself circumspect, Kher has said he changed his negative perception of Singh while portraying him and now respects him. The sting lies not in his performance but in portraying Singh, walking robot-like, as a premier who lived and worked under the thumb of then Congress chief Sonia Gandhi. Critics who dismiss the film as propaganda point out that Kher’s wife is a BJP lawmaker. He has himself been the government’s defender on media and culture-related issues. The film is credited to a less-known family of BJP supporters totally new to film-making, It has father and son respectively producing and directing it. Film-land gossip alleges Kher’s directorial touch. Certainly, Singh’s appointment was ‘accidental’ in that Sonia had surprised everyone by appointing him, a loyalist, when it was she who had won the 2004 election. Singh has apparently taken the film in his stride. Silent when the book was published, five years on, he has gamely said that he was not only “an accidental prime” but also “an accidental finance minister,” This is true. Pakistan keeps a wary eye on Indian films it imports. Seventeen have been denied censors’ clearance, latest being ‘Manto’ on the Urdu writer, although Saadat Hasan Manto belonged equally to India and Pakistan. But ‘The Accidental Prime Minister” was quickly cleared, ostensibly because Singh was born in present-day Pakistan and enjoys goodwill, but also as part of Imran Khan’s peace overtures that India has been rebuffing. With this and other films, Modi/BJP have a free run since other parties have nothing to offer. Congress, the principal target, supposedly short of funds, is smarting silently. Exceptions are expectedly from Telugu language cinema, India’s largest film-maker. “Maha Nayakudu” glorifies the cinematic and political excellence of thespian N T Ramarao, who rose to be chief minister of Andhra Pradesh. Son Balakrishna plays the father. Chandrababu Naidu, NTR’s son-in-law and the current chief minister and Telugu Desam Party chief, could reap political/electoral benefit. His political rival Jaganmohan Reddy is behind a film on father Rajasekhara Reddy, yet another ex-Andhra Pradesh chief minister. Malayalam cinema superstar Mamutty plays Rajasekhara. But when it comes to films — and politics — things don’t always work as planned or hoped for. The Singh-film’s January 11 release clashed with “Uri: The Surgical Strike”. This film is about the Indian Army’s lightening commando operation conducted a few km inside Pakistan-controlled Kashmir to destroy terrorists’ launching pads meant for infiltration. Security analysts are divided over the Modi Government’s going public to draw political mileage over this operation. Now, this better-made action film has overtaken the “surgical (cinematic) strike” at Manmohan Singh. 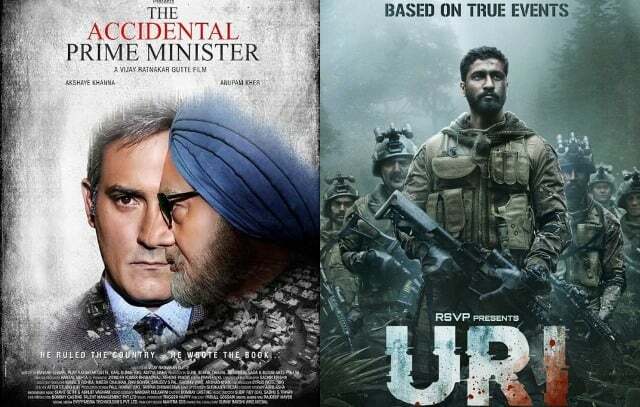 ‘Uri…’ is a hit, while the Singh saga has shown a sharp drop at the box office. Adding to the ‘Uri..’ grist is Pakistan’s denying that the strike ever happened. But ‘Uri…’s gung-ho value is high. It raises the army’s morale, but also for the government to take full credit and for sending out a political message of patriotism to the intending voter. In this climate of political one-upmanship, it would be naïve to ignore the just-released ‘Thackeray’ on late Balasaheb Thackeray. For four decades, this cartoonist-turned acid-tongued founder of the Shiv Sena had Bombay (now Mumbai) under his thumb. The political and business leaders held him in awe and fear. Ironically, Thackeray whose chauvinistic, anti-Muslim “Mumbai-for Marathis” platform has had the ‘outsiders’ from other parts of India, if not always living in fear, perennially on the back-foot, has been portrayed, brilliantly, by Nawazuddin Siddiqui, a Muslim from Uttar Pradesh. Handiwork of the Sena leadership, it could help the Maharashtra-based party, engaged in daily verbal run-ins with Modi and the BJP, to bargain for an upper hand in seat-sharing for the elections. This is despite the historical fact that the target of this icon of Indian history was the British rulers against whom she died fighting in 1857. The emphasis on her devout and brave ‘Hindu’ persona could promote the Hindutva platform that both parties espouse. Compared to these overt poll-eve efforts, two films, “Toilet: Ek Prem Katha” that stressed on domestic sanitation, and ‘Padman’ on personal female health, fell well within Modi’s advocacy for women’s welfare, seem mild, apolitical entertainers. Both were hits. An election, after all, demands an aggressive approach. Wild political speculation by some analysts has the government resorting to another “surgical strike” if not a larger, but limited, military operation on the western border as an eletion-winner. But Modi need not risk that. Come March, ‘Hotel Mumbai’ is up for release in theatres across the country. It will remind of the terrorists attack on Mumbai’s Taj Mahal Hotel in 2008. And, perhaps, tell you how Singh’s government ‘mishandled’ it. Modi has already talked on these lines. Will this heady cinematic elixir of politics and patriotism boost the discourse as election trumpets begin to summon the voters, to what results?